The story begins with the return of Sung Ho (Arata Iura) to his family in Tokyo after 25 years in North Korea. He is suffering from a brain tumor whose treatment is beyond the abilities of North Korean doctors and has been given three months to find a cure in Japan. The starting scene was poignant- The contrast of 3 stern-faced North Korean persons standing facing their South Korean Families who are smiling, beckoning them to come over. Yet they have to wait till they finish all the greeting with the North Korean officers before they can reunite. And the reunion is so calm for the North Korean and you wonder how an environment can change a person. (Its the feeling where all emotions and words are hidden - but all can be seen through his eyes - which is the window to his soul) And we understood why with presence of a North Korean handler (Yang Ik June) who watches Sung Ho's every move. Rather than be free, its a delusion freedom where he is still living behind prison bars in his head, resigned to doing his warders' bidding. - his mission to get his sister to become a spy. The cruelty of reality for him is made worse by attempts by well-meaning friends and family members to reconnect him to his past only stir up thoughts and emotions he has long kept suppressed.Because he knows eventually he still needs to return back. And hope IS a dangerous feeling. Its the same how we feel with our parents at times. They always say its for our good but when we say what we truly want, how many times do they say good job, go for it? Yet we as children, how can we ignore them and do what we want for we hold gratitude to them for bringing us up and as our parents get older, WHO CAN think of ourselves and forget about our responsibilities. Carpe Diem. Its true. But not sacrificing our parents hopes and beliefs. All we can do is try our best to live life and to fulfill whats' needed. yet his sister continues to prod. Asking him to escape. To come to where they are. But how can he endanger his family? And such stark reality when he reflects like a monologue "In that country, reason has no place, You don't ask questions, you just follow... Once you start thinking, you start losing your mind." Ending off this movie was the news that North Korea demanded the 3 to return home without treatment. This dash of hope for the family and the North Korean was heart wrenching where we finally get the parents to face the decision between their belief and their family. Where one father exclaimed whose daughter came for treatment for her disfigurement " my daughter was so happy. My daughter was so happy!" and he began to rant and cry uncontrollably. History has stolen the family in OUR HOMELAND 25 years and 25 years of life time they will never get back. It is as lost like stellar matter swallowed by a black hole. The sister, the parents, the uncle, the class mates or the lover who missed the brother, son, nephew, friend or lover for 25 years - all have to deal with lost time. There remains this hole of life time. The true magic of OUR HOMELAND lies in the paradox. We know as all the characters of the films are ware of - that the time the family and the lovers are missing is lost forever. But in some images there is an echo, an idea of a longing for a life, no one has been able to live. 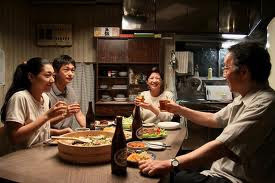 It can be sensed in the incredible beautiful scene of a reunion with the brother, who returns after 25 years to Japan (for medical treatment with a special permission by the authorities in North Korea) with his school mates and his former love. An old love song is a bittersweet reflex of a romance which is buried under the weight of 25 years. A last meeting with the brother and the love of his youth. Both are married to different partners. The separation will be final. They walk through an idyllic landscape. For a fleeting moment we realize in all its power the happiness which really never took place. The film celebrates this moments as long as possible. There are things in this film you can describe and things you can´t. There are lapses of silence in this film between the dialogues. When the pain has no words, the bodies of these excellent actors are cramping themselves, they are beginning to dither. It often seems they are close to blast. As we know cinema is a result of the mechanism of a camera and its ability to betray the human eye, the films by Yang Yonghi remind us rather in a human body and a soul than in this technical phenomenon of the moving image. It seems we learn rather to trust this strong and also vulnerable body and soul than the cold perfection of the cinematic device. As she said in an interview from 2007, "when she began to film her family, she began to consider the camera not as a machine which records but al part of her body". I don´t know really what is happening with me when I see the films by Yang Yonghi. I knew I am confronted with a piece of history from another country, another culture. But I am still under schlock how deep these films are moving me. In DEAR PYONGYANG I felt like seeing my mother the second time dying. In SONA, THE OTHER MYSELF (now: Goodbye Pyongyang), I realized a strange love and affection to my own family I buried for a long time in my heart. In OUR HOMELAND, Yang Yonghi´s "Search for the lost time" seems to be at the same time a poet, a chronicler of her own story but also a scientist who re-constructs a situation she experienced for approaching a better understanding of her own story. We witness both, her growing of her understanding of her story while making this film as our growing of understanding while seeing this film. In his "Search for the lost Time", Marcel Proust wrote: " We don´t approach happiness but we get an awareness about the reasons which avoid us to be." If I wasn't clear enough to express why my heart is burning from the films by Yang Yonghi there is nothing I can do about it. I made a strange journey with these films and the only thing I know, they brought me back home via the way around Japan and North Korea. PASSIONARTS "Sing with a Heart"